What’s in store for WGN America’s new series? Recently, the network released a first look at their upcoming TV show Shoot the Messenger. Fair warning, though — the series originated in Canada, and CBC cancelled Shoot the Messenger after one season. The thriller drama “follows Daisy Channing (Elyse Levesque), a young reporter trying to balance a messy personal life with a burgeoning career. 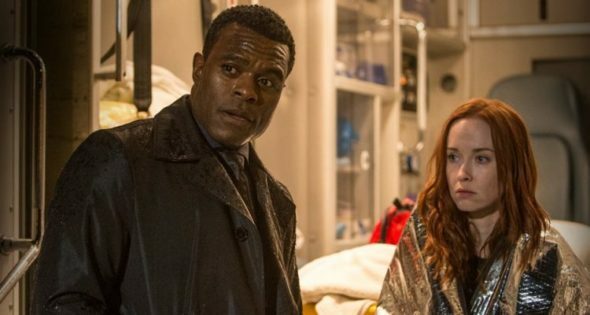 Things begin to go sideways for Daisy when she witnesses a murder she thinks is gang related, only to find herself slowly drawn into an interconnected web of criminal and illicit sexual activity that reaches into the corridors of corporate and political power.” The cast also includes Lyriq Bent, Lucas Bryant, and Alex Kingston. Shoot the Messenger premieres on WGN America on February 26th. What do you think? Are you a fan of thrillers? Will you watch Shoot the Messenger? More about: CBC TV shows: canceled or renewed?, Shoot the Messenger, Shoot the Messenger: canceled or renewed?, WGN America TV shows: canceled or renewed? Shoot the Messenger on WGN America: Cancelled or Renewed for Season Two?